Hugh Devlin (in the black shirt) coaching Rhonnie Manana and Thabo Mokoena with the Irish team members looking on. It’s difficult to know for certain when the game of draughts was first played in South Africa. We do know from the literature on the game that draughts playing was popular in areas of South Africa in the late 19th century and it was most likely introduced by British immigrants in years previous to that. In the late 1880’s one of England’s foremost match players, John Bletcher of Manchester, immigrated to South Africa and took up residence at Pietermaritzburg. Two of the matches he played in England against Fletcher (1874) and Birkenshaw (1879) are recorded in Gould’s “Historic and Memorable Matches” (1884). It was reported in 1900 that “he enjoys a high reputation both at chess and draughts, having held the championship of the colony at both games”. There were a number of active players in the Johannesburg area during this period, one of whom - Mr. A. Roach, contributed a number of problem settings to the “Draughts World” magazine in the 1890’s. Mr. D. Moir, also of Johannesburg, claimed to be the champion of South Africa in 1898, but as J. K. Lyons in his column in the “Liverpool Mercury” asked “is he aware of the presence of Mr. John Bletcher? ”. Mr. Frank Edwards of Wynberg was another prominent player, and he had a brother (Charles H. Edwards of Birmingham) who played in the English Draughts Championships of 1898 at Liverpool. The early 20th century was to see a further development in the game in South Africa with the arrival of Harry Freedman from Glasgow in 1903. Harry Freedman was born in Dundee in 1879 but removed with his parents to Glasgow while he was but a child. In 1893 he joined the draughts club connected with the Hutchesontown Conservative Association and at once was recognised as having a natural aptitude for the game. He was coached by the Association’s Hon. President, Mr. Andrews, and also by the international draughts player James Searight who was also a club member. Freedman’s success in the game was quite extraordinary. He competed for the Hutchesontown club championship in 1895, ’96, and ’97 winning it on each occasion, laterally beating James Robertson the reigning Glasgow Champion in the finals. He competed in the Scottish Championships of 1896 while just seventeen years old, losing his match to the vastly experienced J.C. Brown (The famous “border champion”). His play was described as brash, self-reliant, and “fearlessly venturing upon new ground”. The following year, the young 18-year-old Harry Freedman travelled to the USA on a tour giving simultaneous displays and engaging in a series of challenge matches. In New York he beat a Mr. Swain in a 20 game match by the score of 3-2 and 15 games drawn, and caused quite a flutter by defeating the celebrated Dr. Schaefer in a 20 game stake match 4-0 and 13 draws. He also played a stake match for $400 aside with Sam Grover at Boston, one of America’s legendary players. Although Grover was considered favourite going into the match, Freedman was undisturbed announcing “If I don’t win the match I’ll walk back to Glasgow”! Although Freedman played gallantly, he narrowly lost to Grover 4-2 and 13 games drawn, which was considered by those present to have been an outstanding accomplishment. He also had a sitting with the American champion - Charles F. Barker at Boston, which resulted in a win each and two draws. Returning home via London, England, Freedman played a four game match with the celebrated Alf Jordan (former English champion) which resulted in a tie. “During his recent stay at Lockerbie, (southern Scotland) he took the opportunity of driving to Moffat, being accompanied by Mr. James G. Carruthers, another enthusiastic lover of the silent game. On their return journey a discussion took place as to whether a pedestrian could race a horse attached to a vehicle, Freedman contending that a match between the two would result in favour of the runner, while Carruthers thought the horse would win. To settle the matter the former volunteered to race the horse half-a-mile along the road, and, on Carruthers acquiescing, the young Scottish champion got out of the gig and divested himself of his coat and vest, and a good start was effected. At the outset Harry forged to the front, but the horse to which the whip had frequently been used, drew level when half the distance had been traversed. The runner, after plodding on for a couple of hundred yards further, got into a “critical position”, and was forced to resign. A gentleman, resident in the district, who witnessed the event, informed the police that “a patient had escaped from the Dumfries Lunatic Asylum, and a man driving in a gig was after him”. Freedman then went on a tour of Scotland and England playing exhibition matches and giving simultaneous displays, which included playing while blindfolded and playing mixed games of draughts and chess. In the Scottish Championship of 1900, Freedman lost a protracted match with Robert Stewart (who went on to win the Championship) 3-2 and 9 games drawn, with two of these games lasting more than five hours each. In 1901 Freedman challenged the World Champion Richard Jordan of Edinburgh to a match for the World Championship Title and this came to be played at Edinburgh, Scotland, commencing 12th July 1902. Richard Jordan scored first in game 6, with Freedman replying with a win in game 7. However, this was to be Freeman’s only won game, with Jordan scoring in games nine and seventeen, then suddenly Freedman collapsed losing further games twenty-three, twenty-four, twenty-seven and twenty-eight. Freedman sensationally resigned leaving eleven of the stipulated forty games unplayed. Harry Freedman joined the Salvation Army around 1903 and travelled to South Africa with them shortly afterwards as a missionary to spread the Gospel. A newspaper article published in the “The Standard”, Krugersdorp, South Africa, during 1906 related ..
“In the Salvation Army Hall, Dingaan St. one of the wonderful trophies of grace and the Army’s work will give the story of his life. This particular individual is Captain Harry Freedman, the late renowned draughts and chess player, who as a professional player has given exhibitions in all the leading countries in Europe, as well as in the United States – but since his conversion he has given up playing, and had devoted all the time possible to Salvation Army work. By birth an orthodox Jew, Freeman is a Christian by conviction, but many Hebrews- for whom he has the warmest affection – have in various parts made a point of hearing him. He is not only an impressive speaker, but a fine singer, and through him many have already been drawn to Christ. The meeting will again be led by Captain Freedman”. By 1910 Harry Freedman was still keeping in close touch with the game. At East London he give a simultaneous play where he contested 12 games of draughts and 12 games of chess, and succeeded in winning them all. He was residing in Johannesburg in 1911 and began editing a draughts column in the “Transvaal Weekly” newspaper, through which he arranged a match between the localities. Mr. J. Mc Callum captained a team of nine players residing in Johannesburg, while Mr. Freedman captained a team drawn from Pretoria, Vereniging, and Roodeport. Freedman defeated Mc Callum 3-0 & 1 draw in their individual match (See game below) while the overall result was a victory to Mc Callum’s team by 12 wins to 9 wins, and 8 games drawn. After the match it was decided to arrange a meeting to form a “Transvaal Draughts Association”. The name John Mc Callum is interesting here, as there was a player by the same name that used to play with Freedman at the “Gorbals” Draughts Club in Glasgow, Scotland, and may have been the same person. Another player of the same surname, Wm. Mc Callum, with an address at “The Scotch Stores”, Corner of Jules and Long Streets, Jeppe's Extension, Johannesburg, had sent a number of problems to the “Draughts World” magazine for publication during this period 1910-1913. A “Transvaal Championship” was held in 1912 at Johannesburg, with Mc Callum emerging as the winner over John Campbell in the final. Another entrant to this tournament was an Irishman called James Mc Cormack, who was reputed to be a former “North of Ireland Champion”, but of whom I can find no record here. A further Transvaal Championship of 1913 proved to be quite a success, held at the premises of the Nelscrust Dairy, Johannesburg, and opened by the Mayor. The final results of the 1913 championships were; H. Freedman 24 points, J. Haliburton 18pts, W. Mc Callum 18pts, J. Dobie 16pts, J. Mc Cormack 12pts, J. Campbell 9pts, and brothers’ H. Broer 8pts, and B. Broer 7pts. Freedman was also gaining laurels in the field of chess around Johannesburg, having won the Union Chess Club handicap tournament that year while playing from scratch, during which he lost one game out of 24 played! “I hearby challenge any player in the world for £100 a-side and the championship. This offer will remain open until the end of June 1913. Failing an acceptance of the challenge, on or before that date, I shall claim the title. I am willing to allow my opponent £50 expences in the event of the latter being defeated.” Harry Freedman. With news of a possible Alf Jordan Vs Robt. Stewart match being arranged, Harry Freedman sent a telegram to the “Draught World” stating that he would hold back on his challenge, and was prepared to play the winner of the Jordan Vs Stewart match. John Campbell, the Hon. Secretary of the Transvaal Association, wrote to say that “Mr. Freeman’s supporters in South Africa have formed themselves into a committee to make arrangements for bringing this matter to an issue. There is plenty of enthusiasm for the game in this part of the world at the present moment, and a tournament open to all South Africa, which an energetic committee is carrying through, will bring the leading players together, and possibly see a South African Association”. History has recorded that this match between Alf Jordan and Robert Stewart did not take place, as Steward refused to travel to the USA, while Jordan refused to play in either England or Scotland. It would seem that Freedman’s aspirations died amongst this bitter dispute. Unfortunately further news of draughts events in South Africa during the period 1914-1925 are scarce. Harry Freedman changed the spelling of his name to “Freeman” around the late 1920’s and had moved to Roodepoort where he was engaged in a business as a wholesale tennis-net manufacturer. He contributed a game to the “Draughts Review” during this period where he played a local enthusiast called Mr. P. Tyson. Harry Freeman remarked in 1932 that there are very few players in South Africa, and he spend his time playing correspondence games, many of which were against a fellow Scotsman called John M. Napier who at that time was domiciled in Blantyre, Nyasaland, East Africa. With the enactment of the apartheid laws in 1948 racial discrimination became institutionalised and touched upon every aspect of social life in South Africa. As integrated social gatherings became prohibited, draughts players of different colours were unable to mix together. Somehow the game of draughts came to be seen as the preserve of black South Africans, while the game of chess was seen as the preserve of white South Africans. Subsequently the apartheid laws made it difficult for people to continue to play both. The arrival of the first democratically elected government in South Africa in 1994 heralded the normalisation of society there. Some of South Africa’s draughts clubs had successfully survived the apartheid regime, and today they can outline a history that spans more than forty years. However, because draughts did not receive any official recognition (as did chess), it did not receive any form of government funding either. With the majority of draughts players in South Africa coming from disadvantaged areas, the game was to receive little funding from its own adherents, and there existed a shortage of playing equipment with many of the players having to resort to making their own boards and pieces. South Africa’s high illiteracy rate (+ 50%) meant that many players were not able to record the notation of moves, use timing clocks, or even read draughts literature. Mind Sports South Africa (MSSA) began to actively help draughts clubs in 1994 to overcome their problems. MSSA's first objective was to introduce standard boards and pieces. With the help of the Department of Sport and Recreation, the Union generated 4 000 boards and sets of pieces and distributed them free and gratis to clubs and schools. Secondly, MSSA helped train key players at the different clubs to teach other players the notation. Thirdly, MSSA attempted to bring as many draughts players from around South Africa into their system of provincial championships, which has it’s own ongoing problems as most draughts players in South Africa are financially disadvantaged and unable to afford to travel. (In some rural areas the unemployment rate can be as high as 60%, with a national average of approximately 40%) Despite these problems, the interest in competitive draughts continues to grow. They also contacted the EDA in 1994 and through Ian Caws they received rulebooks, 3 move opening cards, etc. 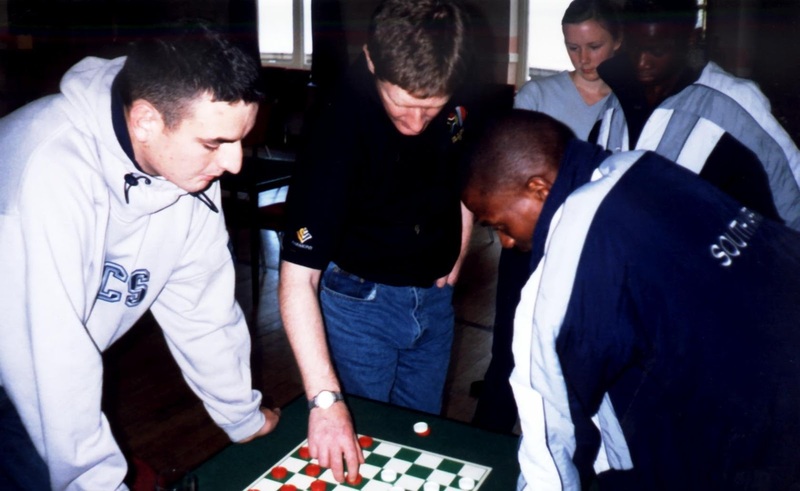 In 1999 the Gauteng Draughts Association invited Ron “Suki” King, World Draughts Champion, to South Africa to help promote the game. Ron King’s tour proved very successful and inspired a great deal of grass roots development, motivating players to become much more involved in organising the game in various areas. Mind Sports South Africa had also been successful in securing sponsorship for the game from the “Harmony Gold Mining Company” which enabled free entry for draughts players to draughts events. The visit of Hugh Devlin is designed to consolidate this work, and build on their achievements to date. Today the future of draughts playing in South Africa seems more secure because of the ongoing work of MSSA.